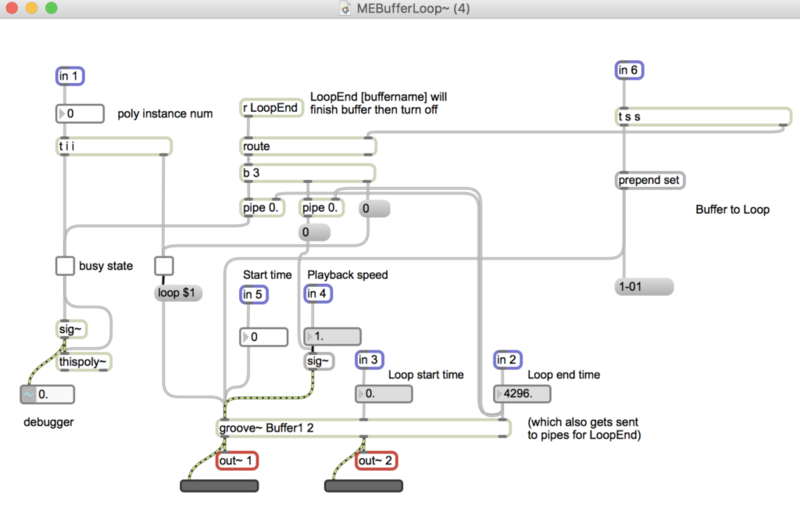 I’ve created a Buffer Recorder and Buffer Loop engine for Minkowski Etudes for Dylan and I’ve hit upon a small programming snag that means I might have to modify how I tag loops and how they end. 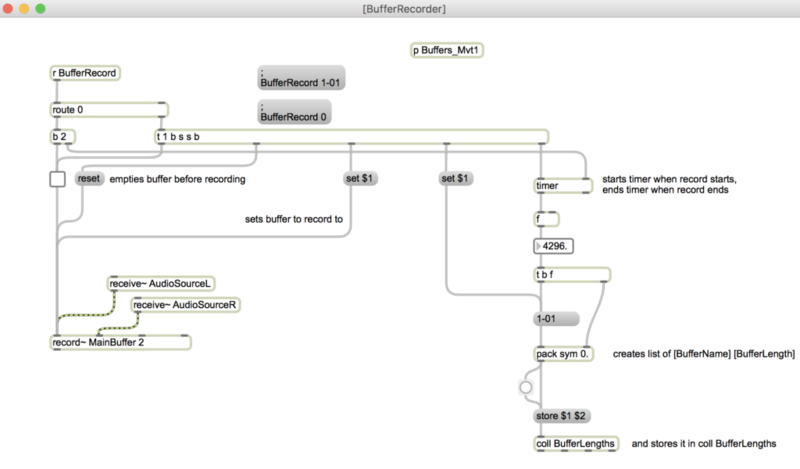 It’s pretty straightforward – you give a command for what buffer you want to record into, it activates the recording and sets a timer to track the length of time recorded. When you’re done recording, it turns off the Record function and stores the length in ms into a list that it can then use for reference for looped playback (because otherwise it would loop the whole buffer which i’ve set at a default for 20s). There’s a lot of small things going on there, but the relevant point to this entry is that the actual engine for playback is going through that [poly~] object. [Poly~] is a way to “clone” a subpatch with multiple instances without actually copy/pasting those individual instances which necessitates routing signals to those individual instances via cumbersome gates and switches. Everything is instead set by a single [poly`] object that has a definable number of “voices” that can be dealt with all at once or individually. In this patch I have 16 different voices. When a loop is activated, a counter iterates to the next [poly~] voice and then all of the loop info is assigned to that voice – it iterates to one voice higher in number to the one that was last used, so if the last voice used was 8, the next loop activation chooses voice 9. The [groove~] object is what actually plays the loop. I send in the buffer name to loop (which replaces the default i created “Buffer1”) as well as all of the variables of loop start/end time and speed. The problem is: since i’m not personally tracking which [poly~] voice is being used for an individual loop (because i just have the counter iterating to the next available voice), I needed to find an alternate way to find a specific loop within a voice instance so i could end just that specific loop as needed. I decided to use the Buffer name (in this instance “1-01”) as a means of doing that, so if i send the command [LoopEnd 1-01], it would find the [poly~] voice that’s looping 1-01 by name and then turn it off. Except what if I want to run multiple voices with the same buffer simultaneously and I only want to turn off some of those voices later? Sending the command [LoopEnd 1-01] would turn off all voices that hold a buffer named 1-01 at once with no ability to deal with that partially. There’s a few different ways to address this. The quick and dirty method is to take any instance in which i want the same buffer materials looped and write that material into multiple buffers. That way, voices in the [poly~] will never have duplicate names. It’s sloppy and would require a ton of extra CPU buffer depending on how many copies of a single buffer i would want to create. 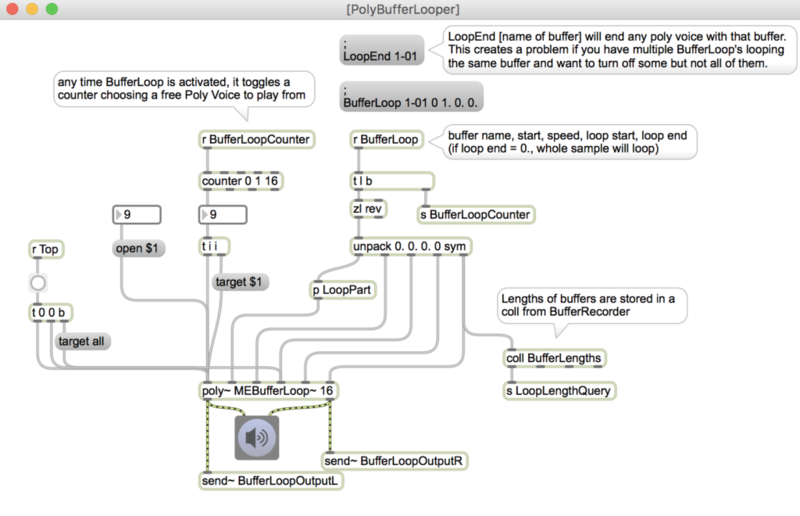 A more programmatically clean but inflexible way is to identify the loops by poly voice only with no concern for what’s there. That could create some potential problems down the road if, say, one Record Buffer fails to trigger or the counter iterates wrong or something and now sample 1 is not located in voice 1 where it’s supposed to be and i accidentally activate or cut the wrong loop. The most airtight but most difficult to program way is to somehow link the name of the sample with either the voice it’s connected to or its simultaneous iteration number and then somehow program LoopEnds to know which voice each simultaneous iteration is connected to even if that voice is different every performance. As i type this out, I may have a strategy to address this, but I still need to work out some of the details in my head to make sure it will work. If it doesn’t, i’ll probably go quick and dirty and hope that my laptop can handle the CPU load that would be necessary. We’ll see what happens.